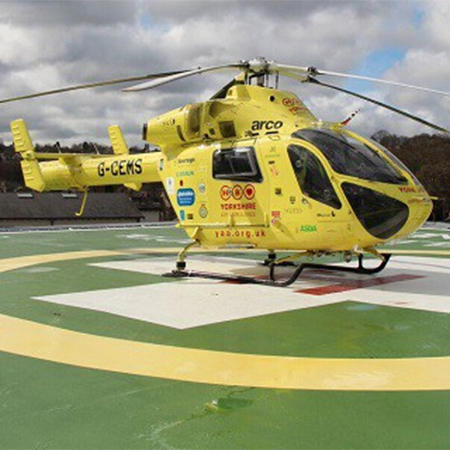 Thermogroup were chosen to deliver a specification for heating the main helipad and the ramp which led from the helipad to the NGH Sheffield. Heating was required to prevent ice and snow forming which would inhibit the team from safely transporting patients to hospital. Thermodrive, a range of intelligent driveway heating was chosen for the project. The system senses when there is a risk of snow or ice build-up and automatically switches on to ensure your driveways and vital access ways stay safe and usable in cold winter conditions. The solution for the helideck and access ramp involved using a 3 phase 400V system with an output of 300W/M2. The system was designed in 3/4 sections to ensure load did not exceed the available supply.